Recently a Nicaraguan military commander invaded a Costa Rican territory and ordered troops to take down a Costa Rican flag and replace it with Nicaragua's. He went through all this trouble because of an error on Google Maps. 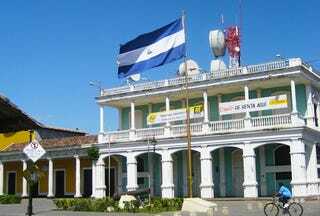 A Nicaraguan military commander recently invaded Costa Rican territory, and ordered troops to take down a Costa Rican flag and replace it with Nicaragua's. Was this the work of a brash commander, going rogue on his superiors? A new policy of Nicaraguan imperialism? Neither. The incident was caused by an error in Google Maps. SearchEngineLand translates the details from La Nación, Costa Rica's largest newspaper, which reported that commander Eden Pastora blamed the incursion on a misleading border on Google Maps that was off by some 3000 meters. A Google spokesperson was unsure what caused the mapping error. Whatever the answer, this could play into Bing's next marketing strategy: Bing, the search engine that doesn't cause international disputes. You may well blame the Nicaraguan military for using Google Maps — which, for all its usefulness in everyday life, is a relatively imprecise tool for official exercises near borders. But it's been little more than three years since the British Navy had the same problem, straying into Iranian waters by accident (Iran being far more dangerous than Costa Rica, which doesn't even have a full-time military) and blaming its military-grade GPS equipment for the error. A month before that, the Swiss military blundered into Lichtenstein on a training exercise — because, they said, it was dark. That, at least, was one border crossing Google Maps might have prevented.